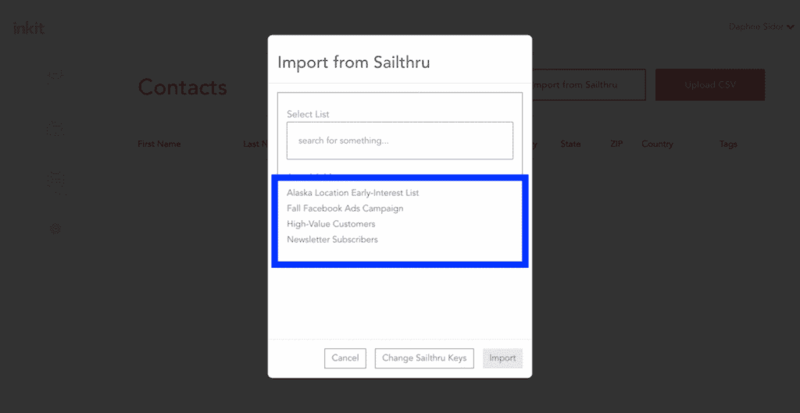 This process allows you to import any list of Sailthru users, including names and addresses, into Inkit, the direct-mail marketing automation platform. For more information, see the Inkit Integration Overview. On the Inkit Contacts page, select Import from Sailthru. If you have not yet done so, you will be prompted to enter your Sailthru API Key and Secret Key. We recommend using an application-specific key dedicated to Inkit. Speak to your Sailthru Customer Success manager or contact support@sailthru.com and ask them to generate an API key for your Inkit integration. Then, paste the keys within Inkit and click Submit Keys. After clicking Import from Sailthru, your Sailthru lists will be displayed. Choose the list you want to import. Once you click Import, all contacts on the selected list will be added to Inkit and tagged with the list name for easy future reference. To send a postcard campaign to the list you just imported, simply open the campaign you want to send and select the list name from the Tags menu. And that’s it! Now you’re ready to start sending direct mail to your Sailthru contacts whenever you like. Need additional integration assistance? Please contact Inkit support.